Why, yes, there are shoes made of straw. They bring to mind the smell scent of those import stores of the 60's....patchouli, a mossy and dusty musty fragrance. It was one of those scents that made me feel kind of dusty and want to run the other way. Sort of like walking into a barn with lots of hay...I actually don't have any experience of barns and hay, but I can imagine. From the first burst of steam and the first scrape of wallpaper, I began to ask....What was I thinking? Do I have straw for brains? Where's the Wizard? What was I thinking? While attempting to wire an extra outlet, a foot wearing a steel toe boot came through the ceiling. I could hear it, I knew it was coming, and all of a sudden, there it was hanging right over my head. After finding out that my hardworking, steel toe boot wearing, world traveling husband was OK, I thought about laughing and laughing we did. Now more work before a project can be completed. What was I thinking? A vision...a project...a makeover...a beautifully redecorated bathroom to be enjoyed by guests and adult children that get swept back in by the revolving front door. Oh, I will get just what I wanted, but not without a few scars and a story to tell. Did God have something to teach me? He gave me more than straw for brains. As I was "cutting in" the corners and around the ceiling with primer, I began to think about how I can paint such a straight line. I can cut a straight line on fabric and draw a straight line on paper. How is that? It occurred to me that I always watch where I am going rather than where I have been with the paint brush, scissors, or a pencil. When I am driving, I only glance in the mirrors to see what is behind me. If I didn't watch where I was going, well, it would add up to a lot of mishaps. The same goes for painting, cutting, and drawing. You must look ahead, with a glance behind you now and then, to see if you are measuring up. I am looking ahead! My future holds a wonderful place, totally decorated for me (no need for do-it-yourself projects) with all of the bells and whistles. God is the master builder and Heaven is His project. Because His Son is my Saviour, I just have to look ahead! Don't get me wrong, I have lots of missed steps, but keeping my eyes on Him helps me to walk straight. Now and then, I glance at the past to make sure I'm measuring up. God did give me a brain! Yesterday?....I wondered! It is Sunday and I will get straight to Sunday Dinner recipes. None of our Sunday Dinner recipes used straw as an ingredient, so I settled for two down in the barn down on the farm down on the ranch recipes. Brown beef and onion. Add all other ingredients. Bring to a boil. Pour into 2 9X13 casserole dishes. Top with Fritos and cheese. Bake at 400 until bubbly. This recipe freezes good, but add Fritos and cheese just before baking. Combine soups, chicken, Ro-tel, broth and onion as a sauce. Layer torn tortillas, sauce, then cheese. Repeat layers ending with cheese. Bake at 325 until bubbly, approx. 30 minutes. Hmmm...Peep Toe or Steel Toe? Saturday has become my most favorite day lately. I work from home, part-time... so many of my days seem the same...I'm not complaining, in fact, I love it, make a little extra spending money, and feel very privileged to be at home. When my husband is traveling the world, Saturday is just another day of the week...maybe even more like another Monday...a little work, a little cleaning, a little laundry,...get the idea, but when he is home, we both take the day off and enjoy! Yesterday, we visited a little flea market...nothing like Canton...but there were treasures to be found and you will get to see them before long, I promise. You might even want one of them. I have great plans for my purchases of the day, but it will take a little work. My husband wears steel toe boots on our excursions. They don't sound too comfortable to me, but he wears them just the same. His steel toe boots lace up around his ankles for support, and the steel toe gives protection, of course, for his toes...in case, I ask him to carry something of substantial weight that just might land on his foot. That is why I don't have to wear them, thank you! I prefer a peep toe. on a search for...rocks! Heavy rocks! Steel toe boot rocks! that are now adorning my our landscape. Melt one stick of butter in large skillet (you may need to add more if butter cooks away). Salt chicken and brown in skillet. Remove chicken and place in 9X13casserole dish. Brown 3-4 T flour in chicken drippings. Add 3-4 cups chicken broth. Bring to a simmer until it thickens. Season with salt and pepper. Pour gravy over chicken. Cover with foil and bake at 350 for about 2 hours. In 9X13 baking dish, mix soup, milk, thyme, pepper, vegetables and chicken. Bake at 400 for 15 minutes. Stir. Arrange biscuits over chicken mixture. Bake 15 minutes or until biscuits are golden brown. I'm not sure that will take care of the chicken...peep,peep...in me, but it makes for good eatin'! Earlier this week, I had quite a scare! As I was sitting in our family room folding freshly laundered towels, I was startled by a scratching and thumping on the window pane directly behind me. Curiosity pried me from my laundry duties to see what the commotion was about. As I peered out our backdoor, I saw what appeared to be a young squirrel, crawling on the window screen. I proceeded out the backdoor onto the deck to shoe shoo it away. Apparently, it was not frightened by me, but only scurried over to the water spout. I walked off the deck in the direction of the spout for it only to run under the blooming in pink Indian Hawthorne bushes. 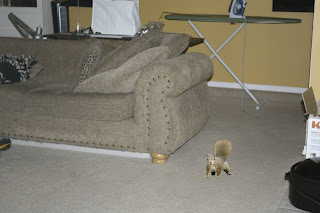 a rascally, rabbit squirrel staring me in the face...in our game room. From the picture you can see some of the games in that room...sewing machine and ironing board. I jumped (my heart is jumping now just writing about it) and screamed, causing him to run for shelter. Leaving the backdoor ajar, I quickly returned to the family room shutting the glass door that separates the two rooms to keep him from entering the rest of the house. I even stuffed a kitchen towel from the laundry basket in the crack below the door...could he squeeze his tiny body through such a small space? What was a girl to do? Call the husband! After much laughter, my husband assured me that it would be found and returned outside when he got home from work....so glad that he was not in Russia, Saudi, Singapore, or some other far away land. Did I need to watch until he came home to see if the squirrel left on his own accord? Heart, be still! I must conquer fear! I circled the house and entered that room from the deck with a handy dandy walking stick, in case, I needed some sort of weapon. Weak in the knees, I entered the room and rattled a few things around hoping he would make a run for it. That rascal was hiding behind an antique trunk. I was able to shoe shoo him from behind it, but he ran behind the sewing machine. I was on the attack again. He ran under the couch, across the floor, and out the door. Mission accomplished. Squirrel gone...fear faced! Fear was a part of my identity for many years. I was the object of many pranks when "friends" found out the reaction I would have when faced with a furry animal...real or not. Kids People can be so cruel sometimes. I spent over 40 years, literally, scared, out of my wits, of dogs....or just about any living creature that had fur. My childhood memory fails me, but I'm told that my dad gave me a wind up toy puppy that barked, jumped, and turned flips. It is suspected that was the beginning of my fear of furry animals. When my youngest son turned 11 years old, there was nothing he wanted more for his birthday than a puppy. I had ignored the request for quite a while. I just couldn't face my fear knowing that I would need to help him with the care of a puppy. What was I going to do while he was at school? How would I teach him to care for a furry puppy? Why would I want to do this to myself? What was a girl to do? I gave in, out of love, but I have to tell you... I was scared. My fear was real! This cute, little, furry puppy quickly became the object of every one's affection except me. I could not face it! I could not touch it! I could not! I would not! Cookies 'n Cream...Cookie, for short...was a black and white beagle that never howled but she sure knew how to get underfoot. One morning as my husband was giving me an embrace before leaving for work, Cookie got under my feet, quickly sending me to my husband's shoulders...literally...my feet on his shoulders. He didn't know that I could move that fast nor climb that high. He could feel my heart beating. He could see that my fear was real. It wasn't a joke, it was no longer funny. He felt my fear. He understood. He knew. Miraculously, my fear was taken away. Really! No one had ever really understood how fear consumed me. Fear of furry animals is no longer a part of my identity. I am free! after all, that furry animal is wild, could carry rabies, could bite, could...but I faced my fear rationally. Later that evening, when I was washing my face....would you call that laundry?...I pulled the towel from my face to see my husband with a squirrel sitting on his shoulder...a Beanie Baby squirrel. Once again I jumped and he laughed...and, yes, I laughed, too! There are other fears in my life that have been hushed, but I reserve the right to revisit Hush Puppies another time. One fear at a time, one post at a time. What are your fears? We all have them. Do you need to Hush Puppies face your fears, too? Early this morning as I made the final preparations for our Easter dinner, I remembered why I don't make cream pies any more. Beginning with the crust...I made three after I was not happy with the first, but decided that the first was not so bad after all. Then, the cream filling...not difficult, but the name of the game is stirring which means standing until the cream thickens...long process that requires patience and a good pair of shoes. Last, the meringue....let me tell you, today that was fun! As I sit down this evening resting my weary feet on my ottoman, I can't help but thank my God for family today. Our family gathering in celebration of Easter was one of food, laughter, games, hunting eggs, outdoor fun when the sun finally came out, and missing those who could not be with us. It was a great day even though it started out gloomy and rainy, the clouds soon rolled away and the sun broke through. What a beautiful picture....a reminder of the gloomy day when the stone rolled way, and the Son broke through on that first Easter. There was enough to feed the five thousand all of us with lots of leftovers for all to take home....then the clean up began....wait just a minute...all the lucky people had departed and those with the pots were left holding cleaning them...."pot luck" dinner. Right now, this ottoman is better than any old pair of shoes, but I would do it all over again tomorrow, if that meant....food, laughter, games, hunting eggs, outdoor fun, and family! The rule of thumb was....you don't wear white shoes before Easter or after Labor Day. I'm not sure that rule still applies. 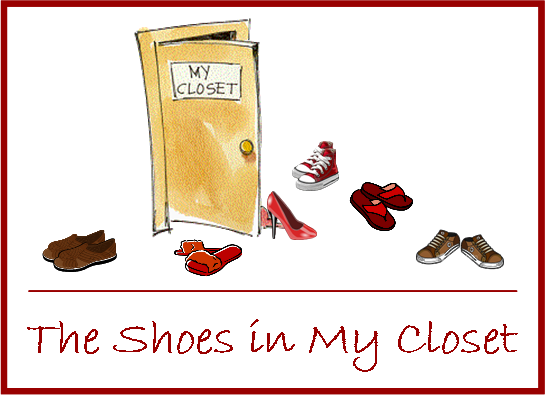 I have an aversion for white shoes... remember....black and brown. I prefer color over white, but when Easter rolls around my mind recalls the sight and scent of white patent leather. You may ask...scent? Patent leather has a scent or maybe it's the product used to remove the black marks. Walking around for only minutes would result in little scuff marks on the pristine white patent leather. If an eraser was used, it removed some of the patent, so on to Vaseline or WD40 to remove those pesky signs of wear. Do you understand why I think patent leather has a scent? Easter reminds me many aromas like the first orchid I received one Easter when I was in the sixth grade. It was my first...from a boy...his family owned the local florist. Candy Easter eggs...the ones with a hard shell and a soft white filling....the red ones were my favorite until red dye was banned. Fresh green grass with a slight dew...Easter eggs hiding beneath its blades. Sugar cookies in the oven shaped like eggs to be iced with a special icing and then there is the smell of a burning mixer because the icing is too thick for a hand-held...I need a KitchenAid. I cannot forget to mention the wonderful aroma of traditional foods associated with a grand Easter meal shared with our large family. We will be converging on my sister's house for Easter dinner on Sunday. We have a pot luck type dinner...the family has all the luck...my sister and I have all the pots. How about a taste of our Easter menu? Combine ingredients. Mix at low speed...WARNING! Do not use a hand-held mixer unless you are ready to buy another one. This is very thick. ...that is if you don't think we will have enough sweets. There are so many of us, we'll just think you're family. Take out of oven and enjoy!!!! Easter...white patent leather shoes...Easter bonnets...baskets...egg hunts...but most important....celebration of our risen Lord! Go-Go boots were all the rage in the 60's...made of white patent leather, fitting the shape of the leg tightly with a low heel and a rounded toe. Sounds attractive? Well, that is about how I have looked all week! It has been a busy one to say the least...really been on the "go-go" with lots of bad hair days...it has been a windy start to April and when you are the one on the "go-go", it just might send you into a rage. so I gave him this hint....old people salad, double nutty, upside down, citrus cake. We love to challenge each other with a play on words. Can you tell? Give up? Carrot cake with raisins (old people salad carrot and raisin salad), coconut and pecans (double nutty), pineapple (upside down cake), and a twist of orange (citrus). He said that there were so many flavors to explore that it almost wasn't carrot cake. Maybe I will be more traditional next year or maybe...Carrot Cake Cake Balls. Sunday Dinner recipes are from around the world (not really, the names just sound that way) since on the "go-go" around the world is where my husband can usually can be found. Lightly brown meat, onion, bell pepper. Add soups and one can of water. Heat. Add half of the cheese, then the spaghetti and combine thoroughly. Put into a 9X13 baking dish. Top with remaining cheese. Bake at 350 for 30 minutes. Spray 9X13 baking dish with cooking spray. Place chicken in dish. Lay a slice of cheese on each breast. Combine soup and wine. Pour over top of chicken. Sprinkle stuffing mix on top of soup mixture. Drizzle butter over top. Bake at 350 for 1 hour. I'll put away those Go-Go boots this week, but since it is April, I may have to get out my galoshes! They made me light on my feet as I walked all over Canton First Monday Trade Days! Once again, it was time for a trip to my favorite spot! Shopping, shopping, and more shopping! Tired feet, tired feet, and more tired feet....but oh, so worth it! 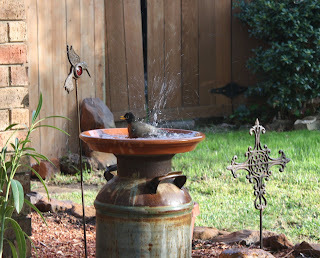 Our challenge or so we thought was to find a milk can for my niece to make a birdbath for her backyard like this one at my house that attracts red robins for splish, splashin' Saturday night baths. Did I say challenge? It was as though every vendor knew just what we were looking for! Milk cans were every where we turned....big ones, small ones, short ones, tall ones! We accomplished this goal without even thinking about it. Canton has so much to see and so much to consider buy like Tupperware (FridgeSmart Keepers are the best), plants and beautiful flowers, antiques, and jewelry. Yes, daughter of mine, that is an A.
Oh, how glad I am that I did that makeover yesterday because now my project list has grown and besides that I am exhausted can't wait to finish another one so that I am ready for next month's trip to...you know where for more shopping for more projects and more great deals.